The Palm Coast charter school becomes the third in six years to shut its doors. 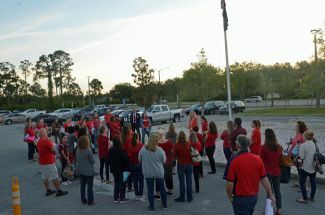 Irregularities and poor student performance led the district to pressure Palm Harbor to close. Palm Coast’s Palm Harbor Academy, one of two charter schools in Flagler, has struggled for most of its existence, and is accused of shifting students to a “private school” so they can avoid being tested. Sheriff Staly and Superintendent Tager are negotiating an increase of the school deputies’ program to $1.8 million split 50-50, with the schools’ share paid by the state and the sheriff’s by the County Commission. Superintendent Jim Tager rear-ended a pick-up truck that rear-ended the sheriff’s SUV when a driver in front of the sheriff abruptly stopped through a green light, causing the wreck.